Aberdeen manager Derek McInnes and his assistant Tony Docherty. The Dons boss watched his side’s outstanding away run of results come to an end following a poor second half display at Hearts on Saturday as the Jambos came from behind to hand the Dons their first defeat in 10 away matches. The loss allowed Kilmarnock to move above Aberdeen into third place while Hearts now trail the Dons by two points with seven games remaining. 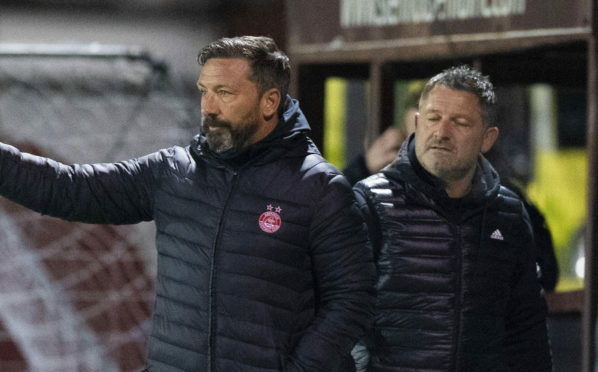 Only the top three clubs are guaranteed European football next season and with Motherwell visiting Pittodrie tomorrow McInnes knows it is imperative his side gets back to winning ways. He said: “We’ve got work to do. Being in Europe is very important to me and everybody at the club. It’s something we talk about at the start of every campaign and we have to show that response on Wednesday against a team which is in good form. “We need to show a level of performance to win the game on Wednesday. The Dons boss is frustrated at how his side let victory slip from their grasp in the capital. Leading 1-0 at the break thanks to Connor McLennan’s goal, the Dons were punished for a poor second-half showing against Hearts and the manner of the defeat irked the Aberdeen manager. He said: “The first half was as good as we have been really. We looked like a team used to going places and imposing ourselves. We were aggressive and confident and very much in charge of the game. “We spoke about the importance of starting the second half in the same manner but Hearts didn’t do anything different other than get the ball forward a little quicker and we didn’t deal with it. “Hearts are a threat at set plays and the crowd here is brilliant at getting behind their team. Any bit of momentum, they grab on to and I felt we had overcome it but we go from a prominent position of trying to get a second goal in their six yard box to conceding a penalty just inside our box without making a tackle.